Autumn has crept into the kitchen, and brought with her succulent cool-weather greens. They tease and entice with a peppery tang or deep sweetness, and their colors range from the aventurine-pale to creamy jade to the deep verdant emerald of a forest in high summer. Kale and collards, turnip and mustard greens are all the ones I grew up eating from the first whisper of a chill wind in September through the frosts of November and beyond into winter, but my favorite autumnal greens in recent years have been the ones originating in Asia. My favorite of them all is gai lan, also known as Chinese broccoli. Gai lan is a thick-stemmed green with branches ending in wide ovoid dark-green leaves that wilt to a delicious velvety texture in the heat of a wok. The stems, when cooked properly, retain a great deal of crunch without being woody or stringy in the least, and the flavor of them is sweeter than any western-style broccoli I have ever tasted. The truth is, I don’t much like most western broccoli–and when I have to eat it, I tend to eschew the blossom ends that most people like and eat the peeled thick stems which are crisp and juicy and taste almost as good as gai lan. To my taste, gai lan is superior in every way to the usual broccoli, and in addition, it is as filled with vitamins A, B, C and K, and it has high levels of folic acid, magnesium and calcium. All in all, it is a great addition to one’s diet, and its mild, peppery-sweet flavor makes it easy to pair with other foods in stir fry dishes. 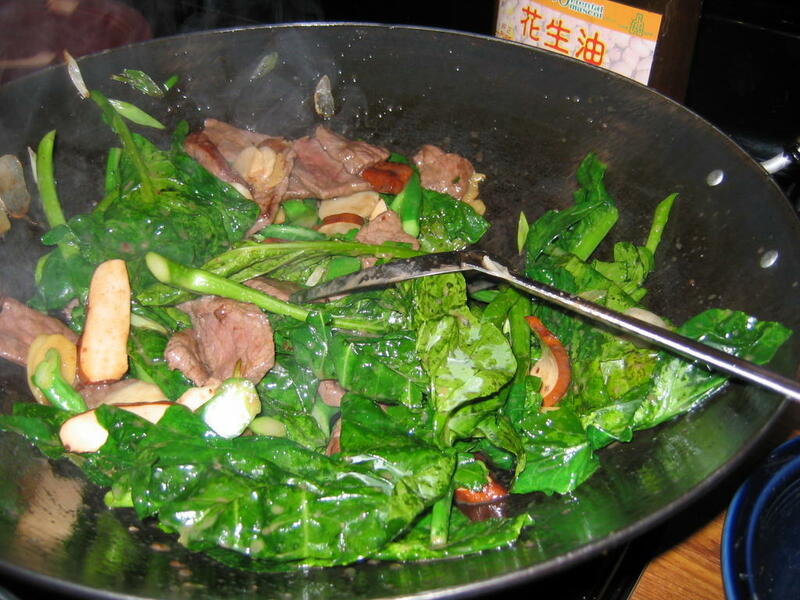 A classic Cantonese dish featuring gai lan is stir fried beef with gai lan–on most American Chinese restaurant menus, the variant is called Beef with Broccoli. Utilizing the more familiar broccoli, the Americanized version, is less interesting in flavor, relying heavily on oyster sauce, onion and sugar to make the thick, gloppy brown sauce that seems to go on anything with red meat on it in bad take-out places. Using the more interesting gai lan brings life back to the dish; the sweetness of the stalks calls for the use Shao Hsing wine or sherry, while the tangier leaves beg to be paired with stong flavors like ginger or fermented black beans. Oyster sauce, when used judiciously, adds a complexity to the dish that is lacking if it is left out; garlic complements the mustardy tinge to the greens well, and just a dash of sesame oil rounds everything out with a sublime fragrance. There is, of course, a problem with cooking gai lan–the lower stalks are very thick–about as thick as my thumb, while the leaf stalks and leaves are much thinner. If you cook the stalks long enough, the leaves have turned into droopy goo, and if you cook the leaves just until they have wilted into a velvety richness, the stalks are still on the overly crunchy side. 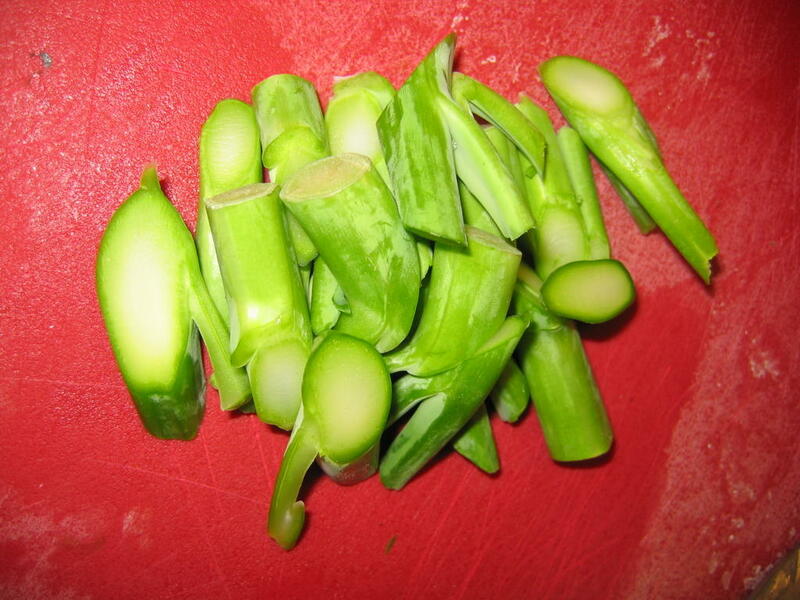 I solve this problem by cutting the smaller stalks with the leaves off of the larger stalks, and then cut the lower stalks on the bias into bite-sized pieces, as pictured above. Then, as I cook, I put the lower stalk pieces in long before I throw in the thinner leaf stalks. In this way, both parts of the green come out cooked to perfection: the thick stalks are still crunchy, but not tough, and the leaves are meltingly tender. There are many choices of what to add into the dish for textural interest and added nutrition: carrots would add great color contrast and boost the sweetness of the jade-colored stalks. I like to use fresh water chestnuts when I can get them, however–they perform much the same function as carrots would, but have an even more unique texture and flavor. In some restaurants, the chefs add black mushrooms that have been rehydrated in a combination of water and wine–this adds a deep, dark richness to the dish that contrasts with the sharper flavor of the greens, while the unctious texture of the mushrooms contrasts with the tender chew of the beef. Since I like to make the dish with more gai lan than beef, but I also have a growing girl in the house, I sometimes like to add slices of pressed, sliced tofu to the dish to give it another protein source without adding any fat or an obtrusive flavor. I just put it in right after the beef, and cook them together so that the beef flavor marries with the tofu. There are probably as many different ways to put this dish together as there are Chinese cooks–the above mentioned ones are just a few thoughts to give people inspirations. The recipe I give is not definitive–it is the one that my family and I like, and is cobbled together from various sources–mostly, from my remembrances of the way in which the dish is cooked in my two favorite Chinese restaurants ever. I probably will use some fermented black beans the next time I cook it, and some onion slices instead of scallions, but until then, I am satisfied with this way of cooking one of the most delicious greens of the early autumn season. Mix together beef, pepper, soy sauce, wine and cornstarch, and allow to marinate at least twenty minutes–I like to do this while I prepare the rest of the ingredients. Heat wok until it smokes, add oil, and heat until it bubbles. 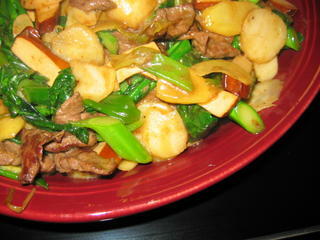 Add garlic, scallions and ginger, and stir fry until quite fragrant–about forty seconds. 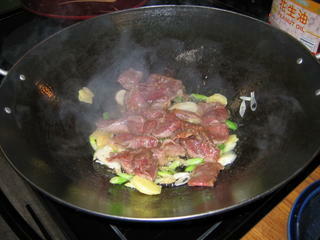 Add beef, reserving any liquid marinade left in the bowl, and spread into a single layer in the bottom of the wok. Add the tofu on top, and leave the meat undisturbed for about a minute, allowing it to brown well on the bottom, then stir fry briskly. When most of the red is gone from the beef, add the thick gai lan stalk pieces and stir fry about one minute, sprinkling the sugar over all, if you use it. 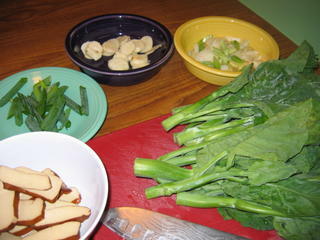 Add the water chestnuts and the scallion tops, then the gai lan leaves. Stir to combine, then pour the broth over the leaves, and stir briskly, letting the combination of boiling broth, steam and hot oil begin the process of wilting the leaves. Keep stirring–and be patient–the leaves take about two minutes to fully wilt. 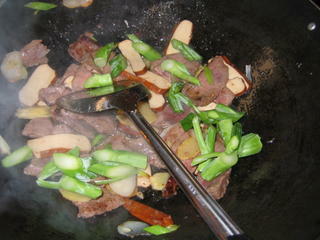 After the leaves have begun wilting, add soy sauce, oyster sauce and any reserved marinade. 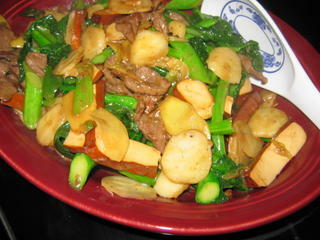 Stir and fry until the leaves have become tender, but are not completely limp and yucky-looking. Remove from the heat, and stir in the sesame oil. Why yes, it is, Kiri–gai lan. I have to try it with the black beans next, I think. My favorite way to have gai lan is just to blanch it quickly and eat it plain. It really just needs nothing else except perhaps a little oyster sauce. I like to eat it raw, Ladi–but then, I tend to like all sorts of improbable vegetables raw, like green beans and turnips, so what do I know? $1.00 a pound? Oy! You are so lucky! Here, in season, it is 2.29 a pound or so. Next, you will tell me that you can get fresh water chestnuts for a penny each and really make my heart break!